I thought this book was pretty cute. I need to get my sewing machine out of storage and actually working before I can do this ... but for those of you with it dusted off ... what a fun project! 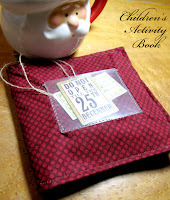 Jen Allyson also provides other fun tutorials and scrapbook freebies on her blog. She designs for DHD designs which is also a great scrapbooking resource.